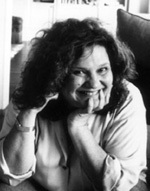 Wendy Wasserstein (1950-2006) was a Brooklyn-born playwright who achieved popular and critical acclaim on Broadway for works that chronicled the triumphs and travails of modern American women. Her plays included Uncommon Women and Others (1977) and The Heidi Chronicles (1988), which won both the Pulitzer Prize and a Tony Award for best play (the first time the award went to a woman). She was twice a panelist at the Seminar, in 1990 for New Directions in American Theater, and again in 2005. This recording from the 2005 Seminar, dedicated to Humor, features Wasserstein reading a passage from The Heidi Chronicles and discussing her play The Sisters Rosensweig. A preceding panel had concluded that writers must mask the identities of family members who were the basis for comic characters in their work. Wasserstein, in turn, discusses the Rosensweig character named “Gorgeous,” modeled after Wendy’s own sister. “When your sister is named Gorgeous, and you’re named Wendy, I think you get to talk about it,” she laughed. Wasserstein concludes with a reading from her collection of essays, Shiksa Goddess, which recounts the harrowing circumstances following the birth of her daughter Lucy Jane, who weighed less than two pounds when she was born 3 months premature to the 48-year-old Wasserstein. This recording is available for noncommercial and educational use only. All rights belong to the author. © 2005 Wendy Wasserstein.